Culms: Erect or ascending, 3-sided, usually rough near tip. Leaves: Usually flat but edges occasionally rolled under, seldom reaching inflorescence, up to 1/3 inch wide; margins very rough. 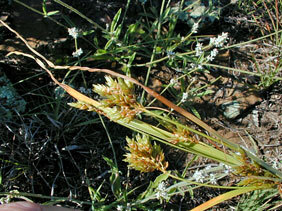 Inflorescences: Cluster of 1-2 sessile spikes and 2-8 short spikes on ascending stalks 1 to 5 inches long; spikes oblong to egg-shaped, each with 5-18 spikelets; involucral bracts 3-6, strongly ascending, as long or much exceeding inflorescence. Spikelets: Spikelets ascending, flattened, 8-18 flowered, 1.2 to 1 inch long; scales egg-shaped, firm, conspicuously nerved, pointed; stamens 3; style 3-cleft. Fruits: Achene, ellipsoid, 3-sided, up to 1/10 inch long, brown or black. Habitat: Lowland prairies or sand hills; sandy soils. Distribution: Throughout Kansas, but infrequently in southeast corner. Forage Value: The Kiowa considered it good horse fodder. Comments: Named for Lewis David von Schweinitz, 1780-1834, the German-born Pennsylvania clergyman who discovered it.